All rooms starting at $55 for single occupancy/per night. $10 for each additional person. Our family-owned motel offers 8 very spacious rooms with your choice of one or two queen-sized beds, (ADA rooms are available by request), and all rooms come complete with a microwave, refrigerator, large bathroom, desk, and cable TV. 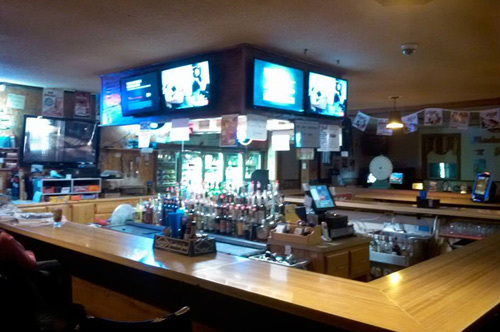 Conveniently within walking distance of the Blacksmith Shop Bar and Grill! Beds: All rooms are either 1 or 2 queen beds. Perfect for the outdoor enthusiast we are located near trails that offer great 4-wheeling, and snowmobiling, as well as access to multiple lakes with great fishing offering panfish, large-mouth bass, northern pike, walleye, and more! Contractor rates available. Please call for details. Lake maps available upon check in. The Blacksmith Shop is a great place to stay if you want to be centralized to all the best lakes in the area. I always love staying at your hotel. The rooms are always very clean and I feel right at home. Me and my family love the spacious rooms. It always makes it easy for us on our fishing trips with all of our gear. Thank you Blacksmith Shop Hotel. Your free fish cleaning facility makes it fast and easy to grill up the catch of the day. We are always happy to stay at the Blacksmith Shop Hotel because we know the rooms are large and always very clean, and well-kept. My children have a hard time sleeping away from home, but they always feel very comfortable when we stay there. We love staying at the Blacksmith Hotel because there are plenty of trails close by for my husband and our sons to take off on with their snowmobiles. They can’t wait for that time of year! I was a little apprehensive when we booked a room because I know my husband likes to take the motorhome and trailer with all of the toys and we often run into problems with parking. But, we found that Blacksmith Hotel had plenty of parking for all of our toys when we get together with our family at the lake. The Blacksmith Shop Motel is conveniently located beside the bar.